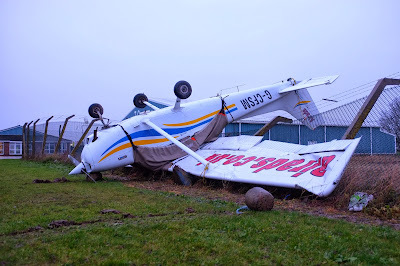 What hurricane, you may ask but around 1am this morning, when my greenhouse imploded, I started to worry about my aircraft parked outside at Manston, tied-down for a job today. After, all, attached to three big concrete blocks, you might think that an aircraft is going nowhere but such was the strength of one the hurricane force gusts after midnight, that my aircraft was picked-up like a child's toy and hurled through the airport's perimeter fence, concrete blocks and all. 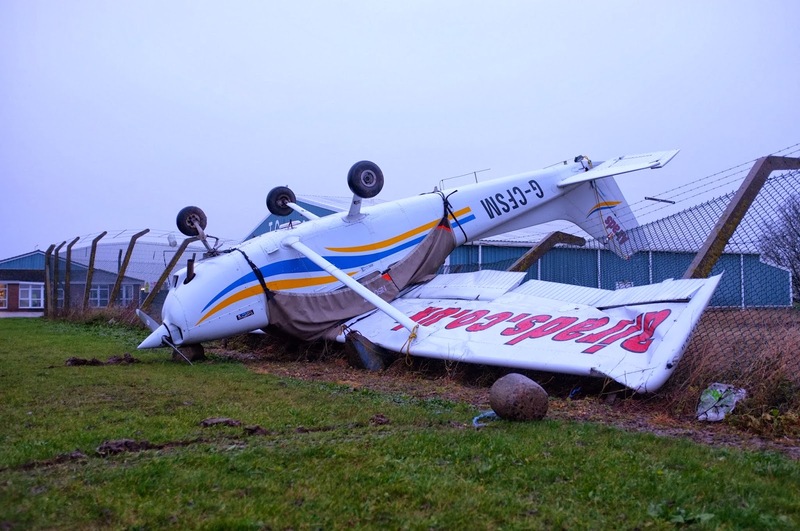 Most of the morning was spent talking to the insurers and arranging for a flatbed, 'cherry-picker' to come to the airport and recover the aircraft back from its position across the fence. It's a complete write-off as you might guess. As the work I do is very specialised, I can't easily replace one aircraft with another as it has to be equipped and certified for banner-towing with modifications. The one small ray of sunlight is that it's December, the off-season and having spoken with my engineer and insurers, I expect to be fully operational again by March with a new aircraft but it has rather dampened my Christmas spirit. The strength of yesterday's winds were remarkable and There's another storm on the way. I suspect the MetOffice may have slightly down-played this storm because of the criticism they received over last month's non-event, which my aircraft weathered quite happily. However, last night's Storm Force 12 in the Channel was something else and I felt very sorry for all the passengers on the four cross-channel ferries who had to ride out the night in thirty-foot waves, unable to put into Dover or Calais. So I guess I'm grounded for a while but don't let that stop me wishing each and every one of you a Very Merry Christmas. How awful for you ! I was beginning to feel hard done by as I lost the felt from my garden shed, a fence panel and the Christmas lights on the gutter of our house last night. Compared to you, I git off lightly ! At least the insurance is sorted out on the plane, but it's still sad to see it like that. You can't do anything about it now so best put it out of your mind for the rest of the Christmas holiday. This will certainly be a Christmas to remember. Happy Christmas Simon. The Rev. Canon Jim Fry passed away on December 17th. His memorial service is to be held at Rochester Cathedral on January 3rd at 2pm. Everyone is welcome. He should be remembered as the Chairman of the North Thanet Conservative Association at the time of your selection in 2006. he made some very wise decisions and we have some wonderful Councillors now because of decisions he made then, yourself, Alistair Bruce and others included. He was a good man, and I will miss him very much. Very sad to hear of the passing of Rev Jim Fry. He was a kind man of great personal integrity and faith. We are all a little poorer for his passing. Sorry to see your loss. Yes, I too remember him with fondness. He was on the selection board for my councillor interview. We didn't always see eye to eye on how our Earth came into being, but he was a wise and honest man with integrity to spare. I for one will miss his council and good guidance. I was so saddened to here of the demise of your plane Simon. I enjoyed the trips we made in her, even if my piloting left a bit to be desired. I used to have a set but they went AWOL and I learned the hard way about heavy concrete sliding on wet grass! I liked Jim he was a nice guy. Sorry to hear your plane has had a tumble now the next post makes sense, Note to self keep up on blog news by reading posts in order! !